Destination: Winery, Distillery and Chalets in Vermont. Chalets in Vermont? Yes, not too far south of Burlington and just outside of Jeffersonville, is Sterling Ridge Resort. 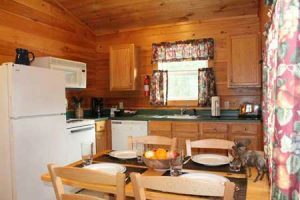 Where you can cozy up in one of our log cabin style chalets in Northern Vermont. These chalets feature a full kitchen and modern appliances among many other things, so why not get cooking! Wouldn’t it be great to wake up to Maple Sticky Buns, baked in your own kitchen and made from local Vermont maple syrup? Then move on to an elegant lunch or dinner. Need a grill? We have those, too. While being creative in the chalet’s kitchen, many will want to have wine or spirits to accompany their cuisine masterpiece. Our recommendations are our local Boyden Valley wines or spirits from Smugglers Notch Distillery. In the town of Cambridge, VT is The Boyden Valley Winery. The Boyden’s craft wines that feature only the finest Vermont grown fruit mixed with traditional winemaking techniques to produce wines that are “clean to the palette and balanced.” Take a tour of the winery and sample their fine Vermont wines. Another added bonus is the Maple Crème liqueur, fantastic on the rocks or over your favorite ice cream! Not a wine drinker? Try samplings of Vermont vodka, rum, gin or bourbon. Smugglers Notch Distillery – named after the famous Smugglers Notch Pass, which was used during Prohibition to run booze to and from Canada, has received many accolades for their fine spirits. Cruise into Jeffersonville and visit the distillery to kick your Cosmo “up a Notch” with their vodka!